Dorothy Says Who? | annie's got a clue . . .
Maybe like me, you try to sample mystery’s greatest hits. Christie, Conan Doyle, Chandler, Hammett . . .. 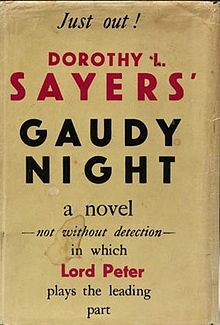 In looking at “classic” lists, and in particular, classic English mysteries, one name in particular, however, has been sorely lacking from my bookshelf — namely, Dorothy Sayers. 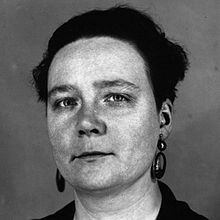 For readers who may not be familiar with Dorothy Sayers, she was a British writer, largely focused on writing between WWI and WWII. She won a scholarship to Oxford and received a “certificate” in literature in 1915 (women were not entitled to degrees at that time). Ultimately, Sayers was one of the first women to receive her degree, an MA in 1920, when Oxford’s policy changed. One of her most well known characters, Lord Peter Wimsey, was largely influenced by her time in and around Oxford, and his foil (later wife), Harriet Vane, appears as a not too subtly autobiographical character. Vane, like Sayers, was educated at Oxford. Like Sayers, Vane was also a crime fiction writer. Like Vane, Sayers had at least one high-profile affair, and had an illegitimate son, raised as her nephew (that last part didn’t happen with Vane or, at least, Sayers never wrote about it). If you haven’t sampled Sayers, I would say to give her a try, if nothing else to add to your classic mystery background. Her writing is very introspective. The “act” of murder (and/or the act of getting away with murder) isn’t the focus of Sayers’ books. Instead, the focus is on the psychology of the characters, their relationship to the victim, and heavy emotions like jealousy, greed, insecurity, sexual frustration and revenge. At times with a somewhat heavier hand than I personally like, Sayer digs into her characters and reveals what makes them tick, exposes their darkest secrets and fears. Lord Peter comes off a bit too perfect and at times like a caricature, but Sayers’ supporting characters are nicely flawed and all-too-human. My first foray in Sayers came with Gaudy Night. I don’t always like to start things in order, so maybe it is no surprise that I began with her penultimate Lord Peter Wimsey book. Although it may have been helpful to have read some of the earlier Wimsey books (particularly Strong Poison, the book where Wimsey first meets and falls for Harriet Vane). However, Sayers re-capped the history between Vane and Wimsey with relative ease and proficiency. If you ask me, observed the Bursar, we discuss everything a great deal too much in this university. We argue about this and that and why and wherefore, instead of getting the thing done. Yet, at the same time, Sayers is protective and proprietary about the environment of the all-women’s college enclave. She clear cares about the nuanced, intelligent and flawed characters among the college’s cast, including the Dean, the Bursar, female dons and students. Sayers’ works straddle these worlds, tackling the role of women in modern England, and contemplating the merits of academic life vs. that of a crime writer/copyrighter. Far more than her contemporary, Christie, Sayers presents her female characters as modern, working, educated women who struggle with their places in society. 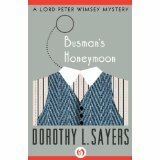 I was so taken with the relationship between Vane and Wimsey — part Nick and Nora Charles/part Holmes and Watson — that I quickly turned my attentions to Busman’s Honeymoon, the next book featuring Lord Peter and Harriet. It can hardly be a spoiler, given the title and the almost eighty-year time gap since the book was first published, to tell you that Lord Peter and Harriet get married. And, in some ways, the book is a little kitschy. But, it also kinda works. I love you — I am at rest with you — I have come home. What kind of life could we have if I knew that you had become less than yourself by marrying me? I was less than enthused with the “solution” to the crime, but nonetheless very sorry that my time with these two characters had come to an end. I sampled a few other Sayer novels, including Whose Body?, the first Lord Peter Wimsey mystery, and In the Teeth of the Evidence, a series of Lord Peter Wimsey short stories. The Wimsey found in Whose Body? is a little more human than the Wimsey in the later novels — he is struggling with post-War trauma, is uncertain of how to proceed, and stumbles a bit with the mystery presented. Altogether a good read. I found the short stories a little too flimsy on plot and character development, something I think Sayers does exceedingly well. But, for a quick read that you can put down/pick up without having to backtrack, they give an interesting back story to Lord Peter and his family. If you are a mystery fan who is still saying Dorothy Who? Pick up a Sayers novel, or two! Happy Reading.